My first weekend of February 2014 concludes with ski touring the East side of Big Creek summit, right across Warm Lake road. The west side of Big Creek Summit pass is a very popular destination with lots of options, but the snow cover looked shallow. The skiing at the east side of th epass offers mostly N and NW slopes with very tight ski lines , but soft snow conditions made it fun. This backcountry ski area is a good option for families or folks getting initiated into backcountry skiing. Be warned that it is important to be able to handle dense tree skiing, since there are no open slopes and the trees are at times pretty close to each other. Slopes angles are generally in the upper 20s. Most of the skiing is just 400 to 600 feet above Big Creek Summit parking pull-out. Big Creek high point to the West side of the road. The rain crust was present at the north aspects I skied, but I was unable to feel the crust while skiing. The crust was only identified during snowpit work. Thirty cms of the latest snow rested above a pencil hard crust formed during the unusually warm days of mid January. During the latest storm two rain crust layers were formed at 10-11 cm and 17-18 cm depths. These two layers were soft, with a hardness at about 1F. A brush was used to uncovered them. Snowpit at North Aspect at 7100 feet of elevation on a slope with 20 degrees. The snowpack at Big Creek summit North Aspect slopes with 7100 feet in elevation was 115 cm deep, which is comparable with similar terrain at Mores Creek Summit. However, slopes with South and East aspects looked "boney". at Big Creek Summit. In fact, I noticed a set of tracks skiing into the road below the north side of the pass where the skier hammered his skis against rocks covered by the new snow. It could be argued that the stability test performed today at Big Creek Summit was irrelevant. The snowpit did not contribute to any decision taken during these ski tour since slopes are well below 35 degrees in the area skied today. But it also true that the practice of inspecting the snow structure through the winter and spring will enhance the understanding of 'snowpack' instability and its dynamic transitions. 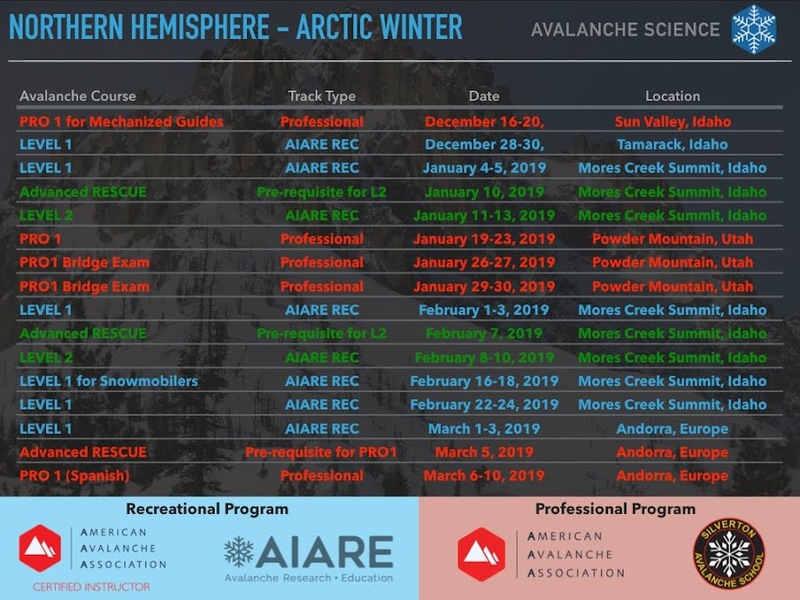 This will inevitably improve skills that enable linking avalanche risk with snowpack structures. Quite simply, expertise in snowpack instability can only be accomplished through repeated exposure to snowpit work. The trick is to perform snowpit work efficiently and in the shortest amount of time. As expertise is gained, it becomes easier to select meaningful locations to gain insights about the snowpack structure. Case in point, careful inspection of the fracture plane revealed that fracture propagation at the 65 cm weak layer occurs along the path with the largest facets. The 10 cm thick weak layer has crystals with an average of 2 mm, but crystals in the fracture plain were 3 mm in size. These 3 mm crystals more often than not formed vertical columns of connected crystals. All facet crystals in the weak layer have rounded to some level, but not sufficiently to initiate sintering and inhibit fracture propagation propensity. Interesting snow formations due to granite spirals. "This type of snowpack should not be viewed with much confidence or certainty. Where there is a slab sitting on this old structure, you need to select terrain carefully. Avoid steep terrain where there is a slab with consequences." What is different this year for many of us, is that although we have faced this type of instability when traveling at mountain regions with continental snow climate, it is indeed rare for this buried facets and shallow snowpack to be widespread in the Boise Mountains, West Central Mountains, and Elkhorn Mountains in Oregon. I understand that some feel comfortable managing the higher risk and consequences we faced this season based in their self-perception of experience. Remember that we rarely have the opportunity to gain experience from rare events, such as the well developed facets buried between 0.5 to 1 meter in our region and that continue to exhibit vigorous propagation propensity during fracture propagation testing. This season requires to sharpen the slope angle measurement techniques and to THINK consequences of a deep slab releasing on the slope about to be skied. Do not expect to see warning signs ... THIS IS A RARE EVENT!